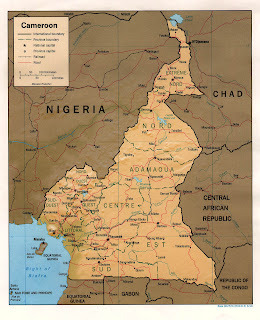 African Water Log: Greetings from Cameroon! After nine months of French classes in Ouagadougou, Burkina Faso, and an all-too-brief vacation, our family has finally been deployed to Cameroon. We are currently in Yaoundé, the capital of Cameroon. On Saturday (August 11), Joe will depart for the village of Baboua in the Central African Republic (CAR) to review the current status of the water project that has been begun in that area by the Lutheran Church. I will return in a month and then we will all move to Garoua Boulaï, Cameroon. We will live there and Joe will travel to the CAR to work when conditions are good..